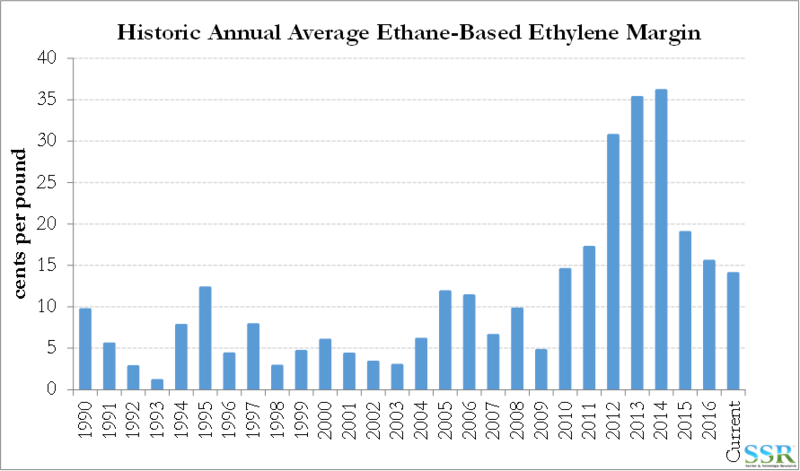 Thought for the week: As ethylene margins fall, asset values rise – is this a peak? For several months we have tried the personal email approach – individually addressed emails covering one or two subjects of interest and focusing on our relevant research. These have had some resonance with clients, but it is a time-consuming process and the net result has been that on any given day only a portion of our core clients have received the emails. We are going back to broadcast – but with regularity – every Friday – early afternoon – hopefully picking up all the relevant news of the week. Please let us know if you would like to remain on this list and if there are others we should add. The Williams ethylene plant has been on the block for some time and a number of potential buyers have been rumored. At $2.1 billion this is a very expensive acquisition – close to replacement value for a facility that is very old at its core. IPIC paid the same amount for the whole of Nova in 2009 – a deal which included almost 4x the amount of ethylene Nova is buying here – how things change in commodities! The land has a low nominal value in Louisiana, but given its scale and adjacency to the ethylene plant it may have a much higher notional value to Nova, and perhaps potential future partners Borealis and Total. The ethylene trading hub may have value if Nova goes ahead with its new ethylene project in JV with Total and Borealis as there will be a need to move ethylene around as well as hold inventory. Total has its large styrene/polystyrene complex adjacent to the Williams facility. If this is the new normal however it may not make life easier for LYB with its recently stated M&A goal – both CPChem and WLK would want more than the $18 billion that LYB has discussed spending if they believe that their businesses were worth 100% of replacement value today. The deal comes as ethylene margins are falling and while Nova may get the certainty of immediate cash flow, at current margins the IRR is no better than an on-time and on-budget new build given the scale and efficiencies on a new unit. We still think that this was the right move for Nova and that it makes more strategic sense than a new-build. Nova will need to invest in polyethylene capacity at Geismar as most of the big ethylene buyers in the US today are building ethylene capacity. Coatings producers all produced solid earnings this week and while SHW was the stand-out, PPG and Akzo managed to beat expectation – which was convenient for both given that underlying demand growth remains an issue within the industry (except at SHW). PPG made the number through share buy-back and cost cutting, while dealing with growth challenges in several business and currency headwinds. There is little question that PPG is a much better managed company than Akzo and it is possible that Akzo’s management reluctance to engage is because they risk embarrassment when PPG achieves much stronger growth and higher earnings with their assets than they have managed themselves. Axalta would be a great comp here given how quickly Carlisle could take a sleepy DuPont business and dramatically increase margins and cash flows. 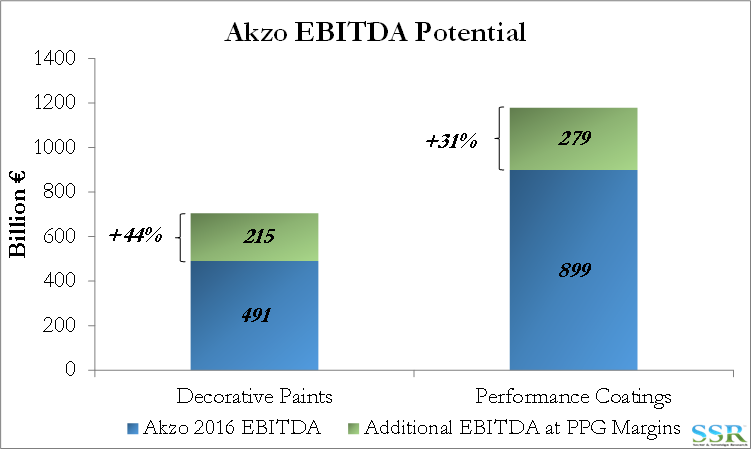 We believe that PPG has significant upside potential from the acquisition of Akzo and consequently can pay more – see research. That said we agree with PPG’s current tactic of not raising its offer before Akzo management is willing to engage. One possible tactic would be to suggest a possible higher price conditional on proper due diligence findings. We also think that PPG needs to find a path that provides a win for Akzo management – which will be hard to do given the size of the hole that we think Akzo has dug for itself at this point, but might include a Vice Chairman role for the current CEO so that he can participate in the success of integrating the two businesses. If they cannot find a middle path – then it becomes “go hostile or go home”. We remain concerned that PPG does not have much of a story without the Akzo deal and see upside in both stocks if the deal goes ahead and downside for both if the deal fails. We wrote a comprehensive update of the industrial gas business this week focused on the possible synergy gains from a PX/LIN deal and the upside that this could mean for PX. 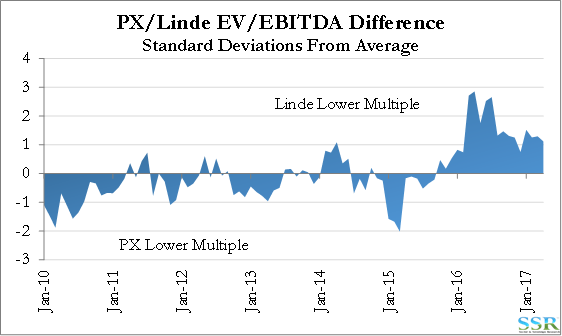 We are concerned that the EV/EBITDA multiple difference between PX and Linde is wide and that it must converge on a merger. Consequently, we see upside in Linde relative to PX. Separately, we see downside in APD relative to the group because of high multiples and slower growth – APD is running out of the growth and improvement initiatives that we have seen for the last three years. Given our overall concerns around growth in the industry, we would play the relative gap between APD and LIN – long LIN, short APD. Only Air Liquide would be a buy in the space today in our view. GE looks interesting – Trian is a very successful driver of change. The stocks response to results today clearly suggests that investors are not interested in an incremental strategy – we have stressed the issues of complexity at GE and we believe that a break-up is inevitable. Trian and Third Point will likely help keep the Dow/DuPont teams focused, but we think the upside is there anyway. We expect Alcoa to be the better stock than Arconic over the medium term and that while a change in leadership may help the strategy at Arconic, the company remains trapped between very large and powerful customers, and raw materials, the pricing of which it has no control over – we do not like the business model – when the squeeze comes it will likely come quickly so we would stay away. Aluminum is off its recent peak but, while volatile, we are in the 16th month of an improving pricing trend.